Looking for a more southern soul food style baked macaroni and cheese? Click here to try out my sister’s recipe. 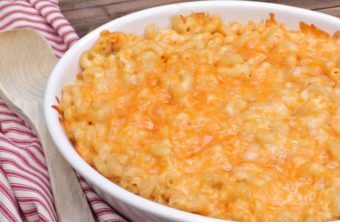 Homemade baked macaroni & cheese….ahhhh…just the thought of those bubbling cheeses & pasta baking to perfection in the oven makes me smile! Is this really the ultimate comfort food ???? I’ve been baking a crap load of homemade macaroni and cheese recipes since last week. Just trying to figure out which one is worthy enough to sit proudly on my Thanksgiving table. 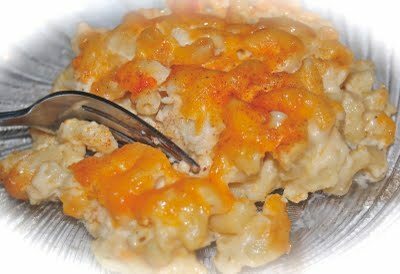 I try to go with a different baked macaroni and cheese recipe every year, but this year after trying so many and being disappointed, I decided to go with my old tried & true recipe. Those “testing” ingredients were getting pretty darn expensive! My purse & waistline simply can not afford to test out any more recipes! In a large pot, add equal parts water & chicken broth. (Just enough to cook your macaroni in) Bring to a boil. Add macaroni and cook until al dente. About 7-8 minutes (look on the back of the box for the cooking time and set your timer so that you don't overcook it) When macaroni is done, drain and set aside. In a large saucepan over medium heat, melt butter & whisk in the flour. Cook for about 2 minutes. Whisking the entire time. Add in the cream cheese & stir until completely dissolved and smooth. Whisk & stir like crazy to get it smooth. I used a spoon to mash the cream cheese up a bit. Remove from heat & add in 4 cups of cheese & stir until smooth. 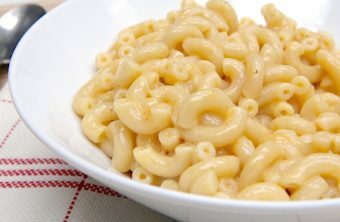 Pour cheese mixture over cooked macaroni and stir to combine. Add some black pepper if you'd like. Grease a 9 X 9-inch pan with butter & pour the mac n cheese into it. Top with sharp cheddar cheese and paprika. Bake for 25-30 minutes. Do not over-bake to prevent it from being dried out. You want the macaroni and cheese to be somewhat jiggly when you take it out. It will set as it cool and just be the creamiest, cheesiest thing ever. Let cool for about 15-20 minutes before digging in so that it can set completely. I never can wait that long but hopefully, you have stronger willpower than me when it comes to macaroni & cheese. Year after year I come back to this recipe!